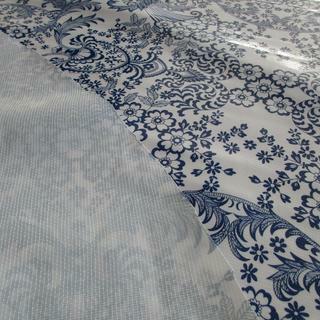 The lacey pattern of Blue Paradise Lace Oilcloth brings a level of sophistication and femininity to oilcloth fabric. Blue flowers and vines contrast against a white background. This durable oilcloth can be used to line drawers of a ladies closet or dresser, or use it to cover a vanity stool or bench in the master bath. The refreshing blue and white color scheme of Blue Paradise Lace Oilcloth would also be a lovely addition to a pool house or sunroom. To make lunchtime clean-up easier and to brighten the breakfast room. I’m going to use it for a table cloth. This is a great complement to my blue and white dishware. 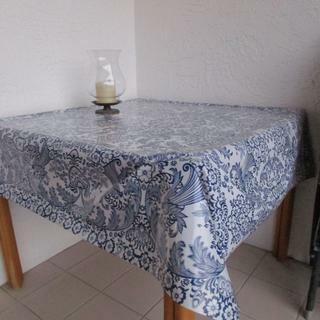 Need a dining room tablecloth impervious to people putting knives and forks down on it! Using this as outdoor tablecloths, and extra will be made into totes. I like the blue pattern. It is not easy to find oilcloth locally. I purchased this to cover the board my embroidery machine sits on. Chosen for drawer liners in my new house. I chose this to go on my kitchen table. 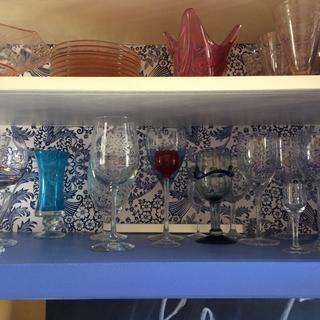 The blue pattern is just perfect to compliment my new blue cabinet color. This pattern reminded me of a william morris design. This is hat my wife wanted. Thanks for having a logical page for placing my order. Will use for decoration on wall. Will be framed. Attractive color and design, and need vinyl type cloth that spills can be cleaned off of. I chose this because I love the design, and I see this design more! perfect for my summer porch table. I liked the pattern and color. I will be using this as a table covering. I'm trying this fabric and pattern for a DIY re-upholstery of dining room chair pads. Interesting patio table cloth and maybe furniture coverings? Bought it before. Really like it. Wanted more. It matches all the blue and white things I have in my house! I have been looking for something like this for a while! I really like the pattern and the color. Can't wait to use this in my classroom. Great to line shelves and a great price too! Is this product backed with a softer material like a flannel backing? BEST ANSWER: This product has a smooth glossy surface on the front, and the back is a textured surface. It is not backed with flannel or a soft lining. No flannel backing. Just oil cloth. can i make a shower curtain with oil cloth? BEST ANSWER: Yes, but it would be very heavy. It might be too heavy, actually. The bar supporting your "curtain" would have to be a strong one and affixed to the walls very strong as well. The pattern is very pretty, but perhaps an actual lace would be better. Yes, it would work, from a water repelling perspective. However, the backing is not flat (has texture) and would be very hard to keep clean. Also, it would be heavy. How wide is the roll of Oilcloth? Can this product be used as a valance? The valences I make look like an awning. Close to the wall and extending out 12 to 14 inches from the wall. BEST ANSWER: Oilcloth isn't generally used in drapery or valence applications because of the sheen and lack of drape. If you're set on this particular fabric, we recommend ordering a sample to be sure that it will work for your project. BEST ANSWER: We strive to provide high quality fabric at the lowest possible prices. For even more savings, sign up for our mailing list to receive periodic coupon codes via email or take advantage of our tiered pricing (the more you buy, the more you save!). CAN I use as parasole out side all summer? Is oil cloth hard to sew? Could you use this to make a roll up shade? 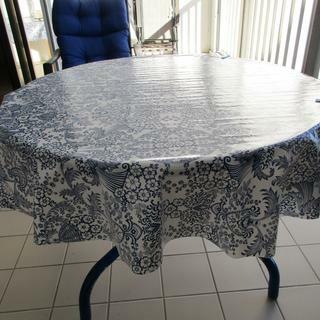 I bought this oilcloth in order to have matching tablecloths for the outside. I have one round and one square table. 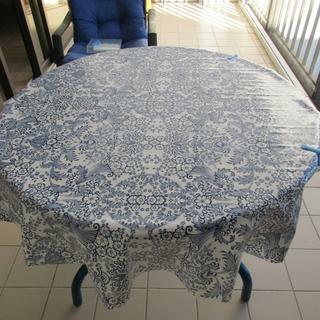 Making the round tablecloth was easy as the material is very pliable and lightweight. It is not as heavy as the old fashioned type oilcloth. It was easy to sew. The backing is a light weave. It is a pretty pattern and goes well with what I already had. I guees I should have figured on what I got for the price. This oilcloth does have a loose weave poly/cotton backing that the vinyl is attached to. We understand that it's easy to miss because it's thin and not very noticeable, but we just want to clarify that point! Used for the inside of lunch tote. Easy to clean.